Good old traditional Jam Pud! Steamed Sponge smothered with Strawberry Jam! Ginger marmalade with Steamed Ginger Sponge, made with Stem & Ground Ginger. Our flag ship pud! Named as our first ever pudding, its a Steamed Sponge with black treacle smothered in Golden Syrup - we add a little bit of orange zest and fresh orange juice. Simply the best ! Steamed Sponge Sticky Toffee pudding with our Creamy Rich Toffee sauce - there are no raisins in this one! 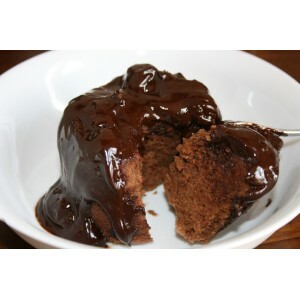 Rich Dark Chocolate sauce tops this Chocolate Sponge. This is a yummy rich pudding for any chocolate lover!